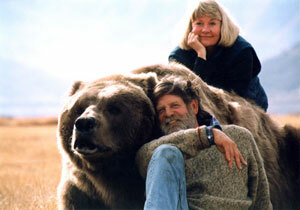 Vital Ground began with one bear, one couple and a unique relationship. 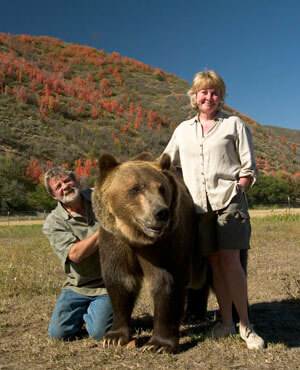 In 1977, Doug and Lynne Seus were building a reputation as world-class animal trainers when they adopted Bart, a Kodiak grizzly who had been born recently in a zoo. He quickly became their biggest star—on the screen and in the flesh. 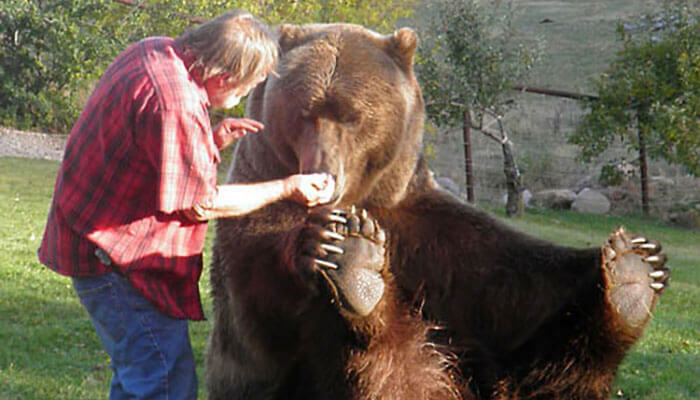 Thanks to his trainers’ care, Bart the Bear grew from a six-pound fuzzball into one of the world’s largest bears, weighing in at 1,500 pounds during his prime. He amazed Doug and Lynne with his intelligence and loyalty and soon became a fixture in Hollywood. If a big film employed a bear during the 1980s and ’90s, there’s a good chance it was Bart. Over a 23-year acting career, his credits included Legends of the Fall, White Fang and more than 30 other titles. Bart was a force on the screen, but his legacy now extends far beyond Hollywood. That’s because Doug and Lynne weren’t content with raising and training one grizzly—their love for Bart inspired them to act on behalf of an entire species. In 1990, they founded The Vital Ground Foundation out of their home in Heber City, Utah, and bought 240 acres of forest and wetland in Montana. The property bordered other protected lands along the Teton River, just beneath the peaks of the Rocky Mountain Front—prime grizzly habitat and an important buffer zone between the mountains of the Bob Marshall Wilderness and ranchlands to the east. With that first strategic purchase, a blueprint for private-land grizzly conservation was born. Vital Ground was off to the races. Vital Ground’s first decade consisted largely of fundraising on behalf of grizzlies. From their home in Utah, Doug and Lynne campaigned in support of many bear conservation initiatives in the Northern Rockies and beyond. Still a Hollywood star, Bart pulled his weight for Vital Ground. He often appeared with the Seuses at fundraising events, and the relationships he formed with his human co-workers inspired many in the film world to support conservation causes. Thanks to Bart, Jennifer Aniston, Jeff Bridges and Brad Pitt—among others—remain generous members of our Grizzly Council. By the mid-90s, Bart was an established star and the Seuses were ready for a new ursine adventure. They adopted Tank, a six-week old grizzly born in captivity. While he wouldn’t reach Bart’s size or stardom, Tank appeared in Dr. Doolittle 2 and later in Aniston and Pitt’s Growing Up Grizzly films. In those projects, he starred alongside Little Bart and Honey Bump, sibling grizzlies whom the Seuses adopted in 2000 after they were orphaned in Alaska as tiny cubs. Their arrival marked a changing of the guard, as Bart, the bear who launched Vital Ground, passed away peacefully at home in Utah on May 10, 2000. Little Bart is now a 1,100-pound adult, little only in comparison to his predecessor. His credits include Big Fish, Without a Paddle, Into the Wild, and recently an episode of Game of Thrones. He still cuddles with Doug, Lynne, and his sister, Honey Bump, who is no small lady at 800 pounds. With Little Bart, Honey Bump and Tank entrenched as our animal ambassadors, Vital Ground soon took its next step in helping wild grizzlies. The Seuses had already expanded the organization’s reach, hiring a small staff and renting office space in nearby Park City. They had followed up their Montana purchase with several land conservation projects in north Idaho over the next decade. But it wasn’t until a chance meeting in an airport that Vital Ground launched onto its current trajectory. After many years working in both public and private-land conservation, wildlife biologist Gary Wolfe was running an independent consulting business out of Missoula, Mont., advising groups like Bear Trust International and the Interagency Grizzly Bear Committee. 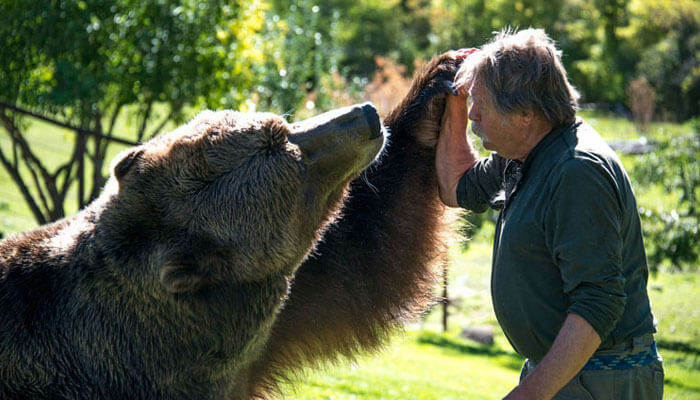 In May 2004, he was changing planes in Salt Lake City, returning to Montana from a wildlife conference in Denver, when Doug Seus spotted his Bear Trust International cap and began a fateful conversation. As it turned out, the Seuses were already considering a big expansion of Vital Ground and moving closer to grizzly country. While their planes’ departures kept Doug and Gary’s first chat to five enthusiastic minutes, the seed was planted and it soon grew into the Vital Ground you know today. During the following year, Gary began his 10-year tenure as executive director and we completed the move from Park City to Missoula. Before long, we’d earned national accreditation as a land trust and shifted the organization’s focus from grant-making to boots-on-the-ground land conservation. Now, a dozen years later, we’ve channeled your support into conservation easements, land purchases and strategic partnerships that connect and protect more than 617,000 acres of grizzly habitat. And we’re just getting started. 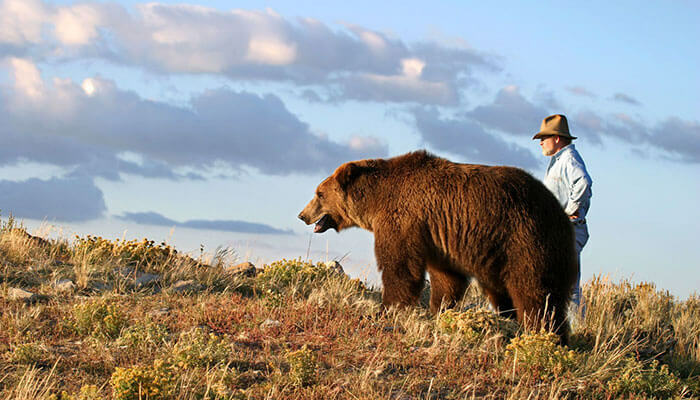 Learn today how you can contribute to the Bart the Bear Memorial Campaign to help write the next chapter of the Vital Ground story. If you've watched any of the 14 "Bears in the Modern World" video series on Vital Ground's YouTube Channel, you've noticed that Doug Seus makes a pitch at the end for Vital Ground. A must-watch video -- these bloopers will make you laugh out loud!